What causes back pain, how you can prevent back injuries, and what exercises are safe and effective to strengthen your back are questions Dr. Stuart McGill provides answers to in his book Low Back Disorders. You may have already heard the name McGill used to back up assertions made in random articles on the spine in health magazines. There’s no reason to rely on a second hand interpretation when you can easily go straight to the source and read his book. Dr. McGill is a leading researcher, but Low Back Disorders is surprisingly understandable as long as you are willing to look a few words up in the dictionary. Low Back Disorders will not replace a visit to your doctor if you have a back injury. The information you will gain from reading it could help you avoid injury though. How injuries are caused, movements to avoid, and then strengthening exercises are all clearly explained and accompanied by loads helpful illustrations. The exercises range from remedial to advanced with lots of modifications offered for anyone who might have conflicting injuries. The biggest advantage of this textbook is that all the information is backed up by extensive research. The second big advantage is that you can directly apply what you learn from the book to your life. McGill recommends what are known as his “Big 3” core exercises to everyone. 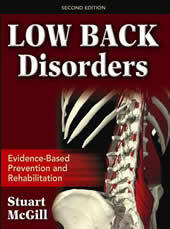 Lower Back Disorders is stocked with practical information, but it is still a textbook. While it is understandable, it is not always the most exciting read on the planet. You will get bored, I promise, but I feel like the information I gained was worth the boredom. Additionally, athletes and other fitness enthusiasts who are more interested in how to safely increase performance may want to go for another book by Stuart McGill called Ultimate Back Fitness and Performance. The key to Low Back Disorders seems to be level of interest. This book might be like that person nobody else likes, but you get their sense of humor and love to be around him or her. If you are interested, it wouldn’t hurt to be passionate, in learning about the spine, this book is worth your time. It pays off in information. However, if you’re not interested in all things lower back related and just looking for a new book to read, Low Back Disorders is definitely not it.